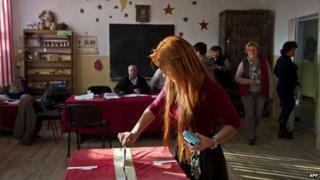 Romania's presidential election looks set for a run-off after partial poll results suggested no candidate had won an overall majority in the first round. With more than 50% of the votes counted, Prime Minister Victor Ponta is leading the race with nearly 40%. His main rival, Klaus Iohannis, has 30%. The run-off - if required - will be on 16 November. Romanians are deciding who will replace Traian Basescu, who is stepping down after serving his two-term limit. The election in the ex-communist nation has occasionally been marred by bitter recriminations. Mr Ponta, a social democrat, often feuded with centre-right President Basescu, who he served under for two years as premier. The 42-year-old prime minister tried to have the president impeached in 2012, while for his part President Basescu recently accused Mr Ponta of having been a spy. If the vote enters a run-off, the prime minister is likely to face Mr Iohannis, a 55-year-old ethnic German mayor who has the support of two centre-right parties. Turnout in the poll was estimated to be at just under 53%. Romania is the second poorest state in the European Union, which it joined in 2007. It is also one of the EU's most corrupt member states, according to Transparency International. Speaking to Reuters news agency, one voter said he was "fed up" with politics in his home country. "When will we start to live better?" said toolmaker Marin Tudose, 48. "Because so far it hasn't happened for me." Another, Elena Pascu, told the AFP news agency that she hoped "the next president will work to give young people a chance".